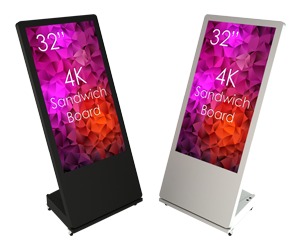 ABCOMDSS provides the North American market with a sleek new line of lightweight, HD and 4K resolution kiosks. With an incredibly small footprint and natural, ergonomic design, presence is stunning while maintaining all the right functions! The kiosk is an impeccably made Swedish design with a focus on a personal feel by combining warm materials and natural colors. Not only will you attract all audiences, but you will also save on floor space! This kiosk doesn’t stop with a quality build, sleek look, and modern design. The ultra-high definition display will leave viewers of your content in awe! 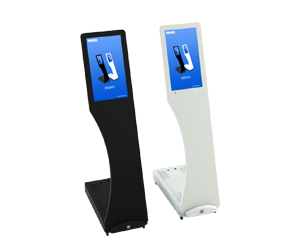 Optional interactive capabilities of up to 10 points of simultaneous touch allow the user to have an individualized experience. Play and Loop video files including .MP4, .MPG, .AVI, .MOV and more with a built in media player, which is located in the rear base of the kiosk with access through a access panel. Reach out to a SWEDX Kiosk Representative today! © 2019 Abcomdss. All manufacturers brand names, registered trademarks and images are property of their respective owners.